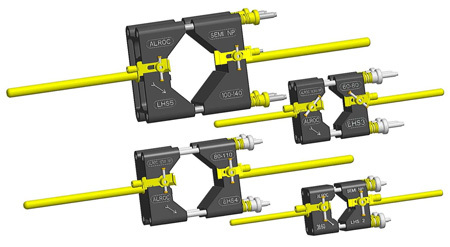 Alroc semi-conductive screen stripping tools are used by high voltage cable jointers to strip bonded andpeelable ("easy strip") semi-conductive screens from 6.6kV, 11kV and 33kV high voltage power cables - 25mm, 30mm and 40mm bonded semi conductive screen strip lengths can be achieved. 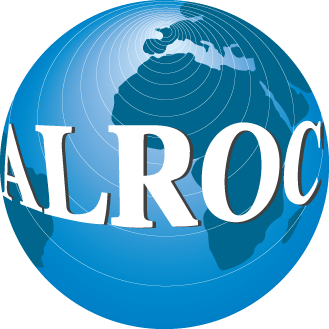 Alroc semi-con stripping tools are designed to remove the peelable semi-conductor layer from high voltage power cables. 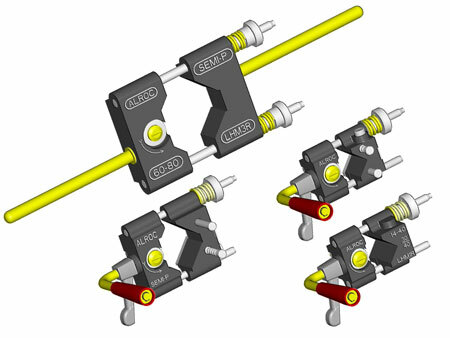 Semi-con stripping tools are available in a range of sizes to deal with varying cable dimensions of 11kV and 33kV high voltage power cables - this versatile Alroc stripping tool works by creating a precise spiral incision with an offset circular blade that is pre-set to the specified size of HV cable it is intended to be used on. This ensures that it will not damage the layers below and results in a perfect surface for efficient LV-HV cable jointing or terminating with heat shrink, cold shrink or push-on cable terminations or joint kits. 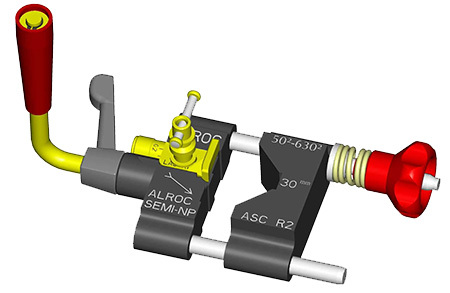 Alroc semi-con stripping tools can effectively remove the bonded semi-conductor from HV high voltage cables. Semi-con strippers are available in various sizes to deal with cables from 38mm to 140mm - Alroc bonded screen stripper tools cut cleanly, leaving a straight edged perfect surface for efficient LV-HV cable jointing or terminating with heat shrink, cold shrink or push-on cable terminations or joint kits. A medium voltage bonded screen must be cut from the cable insulation and it is essential the correct cable jointers tool is used. Tips i) ensure the screen cutting blade is set to the correct depth (excess removal of the cable insulation will reduce the amount of insulation and increase the stress in the MV cable) ii) use lubricating silicone grease on the cable screen before attempting to remove it iii) set and ensure the cable core is straight - a cable bend cal lead to the bonded screen being removed around the whole of the cable iv) if small sections of bonded screen are left on the power cable, the cable jointer should carefully shave and remove it with a piece of glass - if small amounts of bonded screen remains the jointer should use a fine abrasive cloth. The cable jointer should always inspect cable to ensure the bonded screen is totally removed, especially undersides of medium and high voltage power cables. Cable failures are commonly caused by the careless removal and stripping of cable screens, especially removing the screen at the cut-off. Some MV-HV cable jointers still use knives and cut through the screen and into the power cable insulation. This can effectively create void in the MV cable - the result is that partial discharge will gradually break down the cable insulation. This in-built problem will not be indicated during pressure testing prior to the cable, joints and terminations being commissioned - the partial discharge process can take months or years to cause eventual medium-high voltage power cable breakdown. Correct removal of the carbon loaded semi-conducting screen from polymeric insulated high voltage power cables by cable jointers is the single most important factor in controlling the service life of a high voltage cable joint or termination.